Sin and Justice from Mishna and Babylonian Talmud. Baptism: Water & Spirit from DSS, Josephus, Babylonian Talmud. "John Baptizes Jesus," The Jesus Database, an online annotated inventory of the traditions concerning the life and teachings of Jesus. Dr. Gregory C. Jenks, FaithFutures Foundation. "On the Holy Theophany Or On Christ's Baptism," (4th of Four Homilies) by Gregory Thaumaturgus (3rd century). "Baptize me, who am destined to baptize those who believe on me with water, and with the Spirit, and with fire: with water, capable of washing away the defilement of sins; with the Spirit, capable of making the earthly spiritual; with fire, naturally fitted to consume the thorns of transgressions. On hearing these words, the Baptist directed his mind to the object of the salvation, and comprehended the mystery which he had received, and discharged the divine command; for he was at once pious and ready to obey." Commentary on a Harmony of the Evangelists, John Calvin, 1558: Matthew 3:13-17/Mark 1:9-11/Luke 3:21-23. "Christ consecrates our baptism in himself." "We may see heaven opened to us, when we perceive the Spirit descending and working upon us." "Coming up straightway out of the water. The Greek preposition translated "out of" is ek, which means out from within. This could only be true of immersion. Thus all great and candid Pedo-baptist scholars concede that Christ was baptized." Commentary, Mark 1:4-11, Michael Rogness, Preaching This Week, WorkingPreacher.org, 2015. "The main thrust of today’s text and the meaning of Jesus’ baptism for us is that we are baptized into something. A fundamental change takes place in baptism, at whatever age." Baptism and Blessing, David Lose, ...in the meantime..., 2015. "Jesus’ baptism isn’t preamble to all that comes later in his life, it’s the highpoint and climax of the story in a nutshell." "Baptismal Blessings?" Karoline Lewis, Dear Working Preacher, 2015. "When baptism is a wilderness experience, an unexpected entrance of God, and a little terrifying, well then, we will know the meaning of baptism according to Mark." "The Sky Tearing and a Voice Crying," D Mark Davis, Left Behind and Loving It, 2015. "There may even be more than meets the eye in the dove imagery. Remember, this dove turns harpy-like and immediately throws Jesus into the wilderness in the very next verse." "Wet and Well Pleased," Sharron R. Blezard, Stewardship of Life, 2015. "We should also remember that not all who hear these words have experienced baptism yet and may have questions about it as an entry point of faith." "Baptism of the Beloved," Bob Cornwall, Ponderings on a Faith Journey, 2015. "The Politics of the Individual," Alastair Roberts, Political Theology Today, 2015. "...The banks of the Jordan were also a place of transition and succession..."
"Assumed and Healed," Brian Volck, The Ekklesia Project, 2015. "Beginning with Beloved," Jan Richardson, The Painted Prayerbook, 2015. Use of images. "You Are My Beloved," Bob Stuhlmann, Stories from a Priestly Life, 2015. "And the Heavens Were Opened," Andrew King, A Poetic Kind of Place, 2015. The Baptism of the Lord, Scott L. Barton, poetry based on RCL texts, 2015. "A Heavenly Dove," Thomas Beam, 2015. "The Father's Voice," Janet H. Hunt, Dancing with the Word, 2015. "Where do you think Jesus gets his clear sense of direction from? Why do you think this?" "Tracks," Nancy Rockwell, The Bite in the Apple, 2015. "There is a roughhewn quality in Mark’s gospel. It fits the story of a man in the wilderness who wears a camel skin so much better than the gospels that portray Jesus’ baptism as a kind of pageantry in which John fawns over Jesus’ majesty." "Fake Tan?" Andrew Prior, First Impressions, 2015. Evangelio Comentario del San Marcos 1:4-11 por Neddy Astudillo, Working Preacher, 2015. Commentary, Mark 1:4-11, Paul S. Berge, Preaching This Week, WorkingPreacher.org, 2012. "This adverb (Greek, euthus) occurs for the first of 41 occurrences in the gospel of Mark." John the Baptist and Jesus' Baptism by John, audio telling, story in episodes, graphic, audio and written commentaries. Go Tell Communications, Biblical Storytelling for the Global Village, 2012. Holy Textures, Understanding the Bible in its own time and in ours, Mark 1:4-11, David Ewart, 2012. "We might understand the baptism of Jesus as a selfless aligning / embodying	of self with the desires of God. Rather than a functional baptism - that is,	being baptized so that some function could happen - the forgiveness of sins	- this is a revelatory baptism - that is, enacting, confirming and making	visibly real what is already the case: You are my Son, whom I love; with you	I am well pleased." "You'll Know It When It Happens," Caspar Green, Scarlet Letter Bible, 2012. "Baptism might just get you wet. Or it might just change your life." "Of and By," Andrew Prior, First Impressions, 2012. "On this Sunday when we celebrate the Baptism of Jesus, we see Jesus is baptised like us. He makes the same decision to repent as we do." "Cosmic Crossing," Russell Rathbun, The Hardest Question, 2012. "Is this a tear in the firmament that separated the realm of God from the realm of humanity. Is this a parting that will never be repaired? God will continue to be among God’s people in a way God has not been before." Performance Commentary of Mark 1:1-13, Advent 2/Baptism of Jesus, Phil Ruge-Jones, the Network of Biblical Storytellers, You Tube. "Handling Sin," Rick Morley, 2012. "A day was coming when you wouldn’t need a Temple, because Jesus was the new Temple. Because the Holy Spirit was going to soon take up residence in our bodies, and make us a Temple." Comentario del Evangelio, San Marcos 1:4-11, por Doug Avilesbernal, Working Preacher, 2012. Commentary, Mark 1:4-11, Stephen Hultgren, Preaching This Week, WorkingPreacher.org, 2009. Comments (commentary) and Clippings, Chris Haslam, (technical notes for in-depth study), Anglican Diocese of Montreal. "First Thoughts on Passages from Mark in the Lectionary: Baptism of Jesus," William Loader, Murdoch University, Uniting Church in Australia. "?O that you would rend the heavens and come down!? These words of Isaiah 64:1 may have influenced Mark?s choice of language here: Jesus ?saw the heavens rent open? (1:10). This a very graphic way of doing christology. In Jesus there is a meeting of the God sphere and the human sphere." 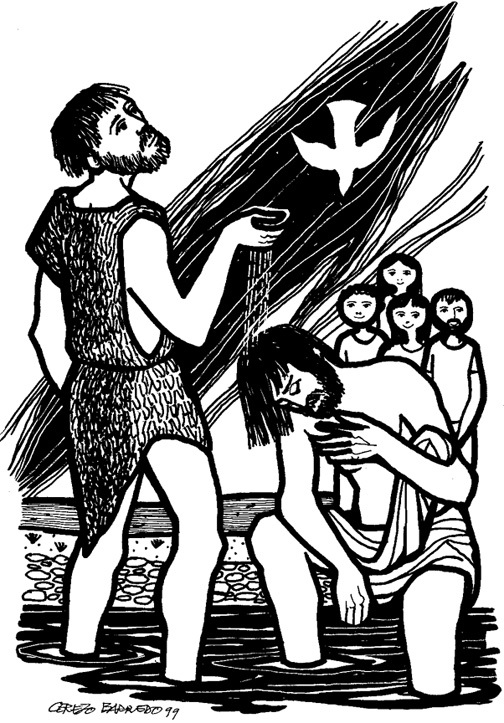 "Baptism of Jesus," Edward F. Markquart, Gospel Analysis, Sermons from Seattle, Grace Lutheran Church, Seattle, Washington. Detailed background and exegesis. "In our baptism, similar things happen to us as happened to Jesus when he was baptized: 1) The Spirit of God comes into us and remains in us. 2) We are declared to be a child of God. 3) We hear that God is well pleased with us." Exegetical Notes, Brian Stoffregen, at CrossMark Christian Resources. "This also leads to a distinction between John's baptism and Christian baptism. I think that Jesus' baptism ushers in a new baptism. Christian baptism is not just a washing away of sin as John's baptism was; but it is the baptism that brings the power of the Holy Spirit and a special relationship with God." Join the Feast, Mark 1:4-11, Lindy Vogado, Union PSCE, 2009. "It is in the waters of baptism that the heavens are torn apart and a voice from heaven claims Jesus as God?s son. Although we rarely think of it as having such a dramatic flourish, baptism today still serves as a time when we recognize our being claimed as children of God." Mark 1:4-11, Paul S. Berge, The Beginning of the Good News: the Epiphany Gospels in Mark and John, Texts in Context, Word & World, Luther Northwestern Theological School, 1997. The Baptism of Our Lord, Donald H. Juel and Patrick R. Keifert, A Markan Epiphany: Lessons from Mark 1, Texts in Context, Word & World, Luther Northwestern Theological School, 1988. "John Baptizes Jesus," Michael A. Turton, Historical Commentary on the Gospel of Mark, "a complete verse-by-verse commentary on the Gospel of Mark, focusing on the historicity of people, places, events, and sayings in the world of the Gospel of Mark." "A Moment of Clarity," Larry Broding, Word-Sunday.Com: A Catholic Resource for This Sunday's Gospel. Adult Study, Children's Story, Family Activity, Support Materials. "Have you ever had a moment of clarity, when you could see things as they really were?" "Mark begins and ends his gospel with schism-a division, a parting, a rending-the schism of the heavens (chapter 1: 10); the schism of the veil in the temple (chapter 15:38)." Wellspring of the Gospel, Catherine McElhinney and Kathryn Turner, Baptism of the Lord B, Weekly Wellsprings. "Meeting Jesus - God and man - people learnt that God really loved and valued them - that God?s favour could rest on them too." Mark 1:4-11, Brian McGowan, Marginally Mark, by an Anglican priest in Western Australia. "Into the wilderness where John the Baptiser is offering - what is it he's offering, a folk alternative to the Jerusalem cultus? A geographic political statement out on the very margins of society? A challenge, as John Dominic Crossan thinks, to Hebrews to symbolically re-enter the Promised Land & re-conquer it for God after baptism for a change of heart out there on the other (wrong) side of Jordan?" "God Can Take the Heat (Mark 1:9-11, Luke 4:1-13)," John C. Purdy, Chapter 2 of God With a Human Face (1993), republished at Religion Online. "Perhaps Jesus was tempted with the option of a normal life. Perhaps, like Goethe's Faust, he was tempted with adventure, beauty, economic power, endless excitement. The Gospel story seems to invite us to regard the final three temptations as a kind of final exam, covering all the other temptations that have been encountered in the course of the forty days." "John the Baptist," "Baptism of Jesus," "Mark 1: John the Baptist," "Mark 1: Jesus' Baptism and Temptation," wikipedia. "Conversion and Baptism: A cross cultural perspective in the light of the encounter between Judaism and Hellenism," William Loader, Murdoch University, Perth, Australia. Making Christ palatable to everyone is almost by definition to deny him. But presenting him in an image distorted by unnecessary, unhelpful and sometimes negating clutter is also to deny him - to people. The issue at stake is as fundamental as the shape of Christian life in the future." "Mark did indeed imagine a link between the tearing of the heavens and the tearing of the temple veil-- since we can now see that in fact in both cases the heavens were torn-- and that he intentionally inserted the motif of the "tearing of the heavenly veil" at both the precise beginning and at the precise end of the earthly career of Jesus, in order to create a powerful and intriguing symbolic inclusio." Blumenthal, David R., "Repentance and Forgiveness," Cross Currents. Charles, J. Daryl, "The 'Coming One'/'Stronger One' and His Baptism: Matt 3:11-12, Mark 1:8, Luke 3:16-17," Pneuma, 1989. DeMaris, Richard E., "Possession, Good and Bad--Ritual, Effects and Side-Effects: The Baptism of Jesus and Mark 1.9-11 from a Cross-Cultural Perspective," Journal for the Study of the New Testament, 2000. Edwards, James R., "The Baptism of Jesus according to the Gospel of Mark," Journal of the Evangelical Theological Society, 1991. Fiddes, Paul S., "Baptism and the Process of Christian Initiation," Ecumenical Review, 2002. Kasper, Walter, "Ecclesiological and Ecumenical Implications of Baptism," The Ecumenical Review, 2000. Pohl, Christine D., "Power and Delight," The Christian Century, 2006. Roth, Diane M., "Living by the Word," The Christian Century, 2015. Sankey, Paul J., "Promise and Fulfillment: a Reader-Response to Mark 1:1-15," Journal for the Study of the New Testament, 1995. Sholis, Barbara, "A Watery Solution," The Christian Century, 2002. Wiarda, Timothy, "Story-Sensitive Exegesis and Old Testament Allusions in Mark," Journal of the Evangelical Theological Society, 2006. "Torn Open, By God," Rev. Maxwell Grant, Day 1, 2015. "In the Hole He Goes," the Rev. Tim Boggess, Day 1, 2009. "Mistaken for Jesus," Rev. Charles Hoffacker, Lectionary.org. "Baptism? What Do We Teach?" Pastor Edward F. Markquart, Sermons from Seattle, Grace Lutheran Church, Seattle, Washington. Baptism of Jesus - 8 January 2006, James Mueller, Göttinger Predigten im Internet: Every Sunday Sermons based on the RCL by a team of Lutheran theologians/ pastors. "Torn Apart Forever," the Rev. Barbara K. Lundblad, Day 1, 2003. Worshiping with Children, Baptism of the Lord, Including children in the congregation's worship, using the Revised Common Lectionary, Carolyn C. Brown, 2015. 2012. "Storypath Lectionary Links: Connecting Children's Literature with our Faith Story," January 11, 2015, Union Presbyterian Seminary. 2012. Faith Formation Journeys, Baptism of Jesus, childrens sermon, 2012. "Jesus' Baptism and Ministry," Illustrating the Story (lessons, children's sermons), coloring pages, activity sheets, crafts, children's songs. MSSS Crafts. "Make Your Father Proud!" Charles Kirkpatrick, Sermons4kids.com. "Gwen Gets It!" children's story by Larry Broding, word-sunday.com. "Soul-ed Out for Jesus," Jim Kerlin, childrensermons.com. "John Baptizes Jesus," children's study, puzzles, coloring sheet, etc. Higher Praise Christian Center. "Crossword on Mark 1," Don Crownover's Bible Puzzles. Mark 1:7-11, at Cerezo Barredo's weekly gospel illustration. Liberation emphasis. Baptism of Jesus, Henry Martin, sermons4kids.com. “Down by the Jordan,” Carolyn Winfrey Gillette’s hymn celebrates Jesus’ baptism and baptism today. The hymn is in the United Methodists’ Worship and Song (2011). Tune: LOBE DEN HERREN 14.14.4.7.8 (“Praise Ye the Lord, the Almighty”). “Spirit of God,” Carolyn Winfrey Gillette’s hymn is inspired by the biblical stories of the Spirit from creation, through the prophets, Jesus (including his baptism), Pentecost and today. Tune: O QUANTA QUALIA 11.11.11.11 (“God of Compassion, in Mercy Befriend Us”). This hymn is in Episcopalians’ Voices Found: Women in the Church's Song and adopted by composer Michael Bedford for an anthem published by the Choristers Guild. “Creator of the Water,” Carolyn Winfrey Gillette’s hymn celebrates the biblical stories about God using water (creation, Noah, Red Sea, Jesus’ baptism and baptism today). Tune: LANCASHIRE 7.6.7.6 D (“The Day of Resurrection”). Hymns with Scripture Allusions: Mark 1:9. The Cyber Hymnal.